At a mere 46.2-square-meters (approx. 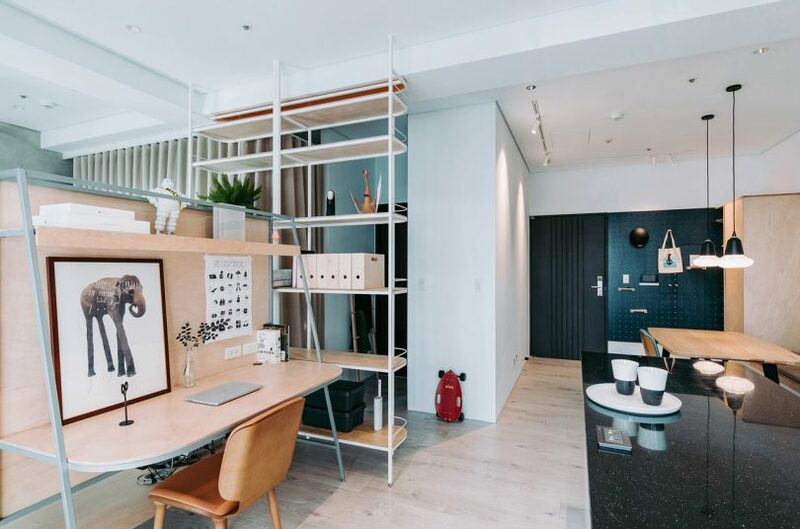 497-square-feet), the T Residence in Kaohsiung, Taiwan required a renovation that included an open floor plan for flow and to keep the space from feeling too closed off. Atelier Boter brought the interior to life with clever multi-functional dividers that separated the spaces according to function while keeping the circulation fluid throughout. The interior palette was mostly kept to a clean black and white with wood finishes to add warmth. A central, open storage unit rises to the ceiling with long shelves for storage. Attached to the shelves is a half-height unit with a desk on one side and the TV on the other. Opposite the kitchen is a compact living room that benefits from the sliding glass doors for light and city views. The living room and the bedroom can be separated with a floor-to-ceiling curtain that closes the bedroom off for privacy.